I suppose I have to call it a fail but I very nearly beat my long standing goal of Sub-60 minutes for the ‘churches loop’. 30 seconds off the mark but nearly three minutes faster than my last attempt. The weather was absolutely spectacular and I may have been slightly hindered by headwind on the way home but the conditions were as close to perfect as you could hope for. I now know that I will reach the goal this year. Tired legs today but I’ll try to get a run in anyway. The NICK trail was ‘dry’ for almost 24 hours. In that time I managed to do two complete laps and two partial laps. I’ve got the time down to 38:56 and can see a lot of time to be gained by technique and skill alone. The type of strength required for technical MTB riding has a lot of room for development too; I had pretty bad muscle pains in my back during the two laps and the muscle now feels knotted. Unfortunately there has been 10 hours of rain so the trail is soaked again… this time of year it’s usually sandy fry and fit for a descent PB. The way it feels now it may never be that way this year. Today’s plan is to do a good double. Easy run during lunchtime and out on the bike tonight. Left work, went home and fell asleep. I’ve not been sleeping well for the past two nights and today that caught up on me. Nothing to worry about – if the body wants sleep the body takes it. After waking up and then putting the kids to bed I made my 10th run comeback of the year. 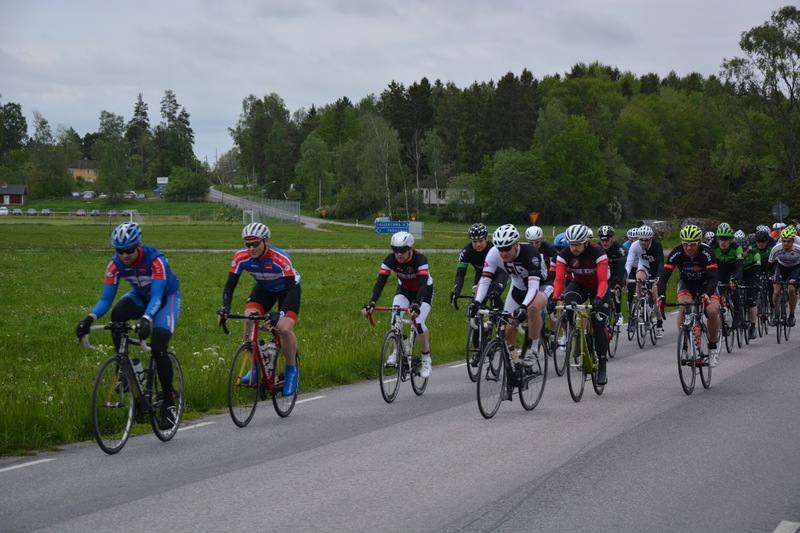 Lidingöloppet is approaching and soon I will be forced into crash training mode or even deciding to cancel it. With that in mind I left the house with only one plan: don’t cross the same path or road during the run. Why such a rule? Because I’m often tempted to turn back home when I’m just starting out with running. Having this rule prevents that. It also has the additional benefit of making you think about something when you are feeling bad. Say for example I’m running, feeling rough and thinking about going home. I have to think about how to get home without crossing the same paths I’ve already ran on. This process stops my thinking about the discomfort. Sometimes you can actually run through the discomfort and then decide to run further. No records were set last night! It being midsummer celebrations I knew the weekend would be a big fat string of zeros. With that in mind I climbed aboard the rollers and bashed out a short and intense set on Thursday. The power numbers I produced were good – both from the perspective of what the rollers were capable of and what I was capable of. The weekend was spend recovering and carbo/alco-loading and once I was recovered from the weekend’s recovery I went out on the MTB on Monday. I started with NICK trail, headed to the hill in Haga park and did four intervals up the thing and then headed back to the NICK trail to attempt another lap. I’m not sure whether to blame the darkness, my fatigue or complete lack of skills on the bike this year but either way I gave up my second lap after only 10 minutes. Got home at 22:30 having done 1:49 of descent training. Tomorrow I’ll do more – probably a run too. I got out on the bike last night… late last night. The good is that I got out and very nearly bagged the idea. An hour and forty minutes of mixed efforts later I arrived home fairly unmotivated and a little tired. The good should be remembered and the bad forgotten. I will have three days of zero training this weekend so I should ignore the low motivation and get the training done. Run home, MTB tonight and a two hour cycle on Thursday should be enough to make the three days off enjoyable – it’ll only get me to 6:30 for the week but I can live with that especially since there is a good chance that I’ll do a 40-50 minute run on Sunday that will bring me over seven hours. There is a pair-TT on Wednesday. 48km on an out and back course. Could be brutal but I’d like to give it a go. Thinking about it during the day. 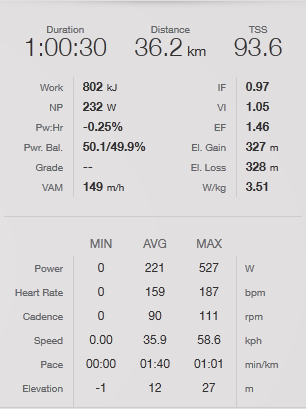 By my standards, this has been a big week: 9:31 of pretty good quality training. The churches loop on Wednesday took it’s toll on me so I took a day to recover. Having done so, I headed north of Stockholm to do the Sälna loop. 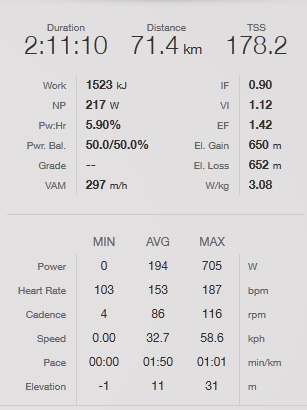 64km done at an average of 31,5km/h – solo and on a pretty windy day. 5 min @ 245W av. 9 min @ 221W av. 17 min @ 217W av. 5 min @ 252W av. I was drained afterwards and probably even more so the net day. I attempted to ride the NICK trail on the MTB at 9:30 the next morning. The legs felt bad at the start but I assumed they would come around.. that never happened. Mentally and physically I struggled around the loop and went home to rest… or so I thought. My neighbor bullied me into to doing a swim-run with him. Nine km total split up as about one km swimming and the rest running. We took it easy and I really enjoyed it. Sunday was a day of rest and today I’m ready to rock again. I made time to go out on the bike tonight – left the house a little before eight with a plan to ride the churches loop pretty hard. Felt pretty good and put a solid ride in for the loop. Towards the end I was having trouble holding power so I believe that the effort was an honest one. Crossed the sign at 1:03:17 (Av. Pwr:204W NP:222W AvSp:34,3km/h). I have a long standing goal (or dream?) to do the loop in under the hour. 59:59,99 would do nicely. In order to do that I’d have to find an extra 1,8km/h somewhere. Favorable conditions could give me some time but there is a great deal of extra fitness required to get those few extra minutes of speed. Will I do it this year? Honestly, I don’t think so. At a stretch, and this is not in the spirit of the goal, I could do it on my tri-bike. I might resort to that if I see that there is no possibility of me making the goal this year. I’m also starting to get a big pull towards MTB riding again. NICK trail is calling and asking me to set a new PB… My fitness is above what it was when I set my previous PB but my skill levels are not what they where… I cringe when I use the word skill – lack of total inability may be closer to the truth. Weather has been good and the trail should be dry. It’s time to give it a blast. Also on the list of things to do is get back running. 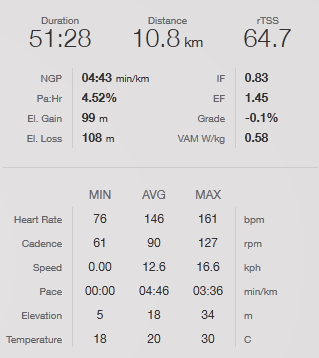 107 days to Lidingöloppet – looking for a PB this year so it’s time to get moving. I did a good run yesterday and will probably do another one tomorrow. The goal is to have a good base before I get to Italy, then I’ll be able to hit the trails hard there – something I was not fit enough to do last year. In short, my priorities have become: Bike, Run and swim if I have time. There’s also a job and a family that precede that motto. I eventually got around to running again last night. Short, easy and slow. The plan is to run 25 minutes or more every day for ten days. No goal other than the previous sentence. After the ten days I start training. The other obvious rule: stop if I feel an injury coming on. I’m also going to try to get into swimming again and am just on my way to swim in an outdoor 50m pool. I’ll report back how that went later on. Just back from swimming. 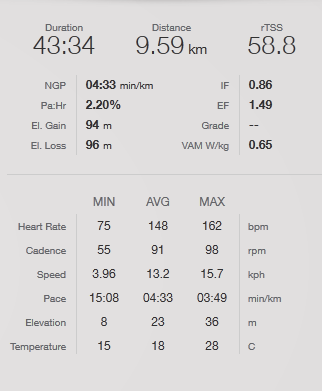 It was bad… pretty bad pace, power, feel for the water. You name it and it was bad. I could go back and analyze the lack of training and discover exactly how it got this bad but I’m not going to do that. I know where I am and I know what I have to do. Swim more and swim more often. I have an easy run to get through tonight and then I’m back on the bike again tomorrow.